On Sunday we stayed hunkered down, waiting for part 2 of our snowstorm of the decade to hit. Our neighbors’ cars across the street hadn’t moved since Saturday morning, so they were both still capped with snow in their respective driveways. I’m not usually interested in this view from our front window, but everything looks different, fresh and more sketchable with the snow. 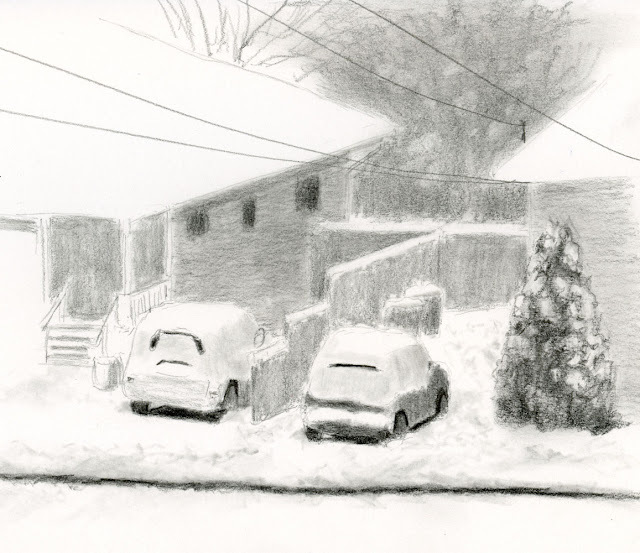 As I was sketching in the warm comfort of our livingroom, a U.S. Mail truck drove up – on Sunday. At first I thought it was because we didn’t receive any mail Saturday, which was surprising but understandable, given the snow. But it wasn’t regular mail – it was an Amazon delivery! Say what you will about Bezos: Snowpocalypse may keep the U.S. Mail away, but two-day Prime stops for nothing.